The stone cold science on hangover cures: this will surprise you! – Is it healthful? The stone cold science on hangover cures: this will surprise you! What I achieved yesterday: little. Why: hangover. Some will swear by the classic remedies: hair of the dog, bacon and eggs, or a couple of sports drinks before bed. I tried all three, finding each to be monumentally ineffective! This prompted me to ask, what does science say is the most effective hangover cure and why on earth didn’t I know this beforehand?! To put it bluntly, lots and lots and lots of things! Hair of the dog: In most people does not change hangover symptoms, or makes them even more severe. Also, appears to increase the incidence of drinking problems (1). Don’t do it! IV drip: All the rage at the moment and extremely expensive – up to $250 for a single dose! Sadly, science says it doesn’t work. Yes, studies conducted on the IV administration of vitamins and saline liquid found them to have no effect on hangover severity whatsoever (1). Artichoke extract: Promoted as a natural cure to the hangover, actually appears to have no effect on hangover symptoms at all (1). Keep those artichokes for eating. Fructose, or glucose supplementation: Did not change hangover severity, whether taken before or after drinking (1). Waste of time and calories! 1. Aspirin: There has been limited research conducted on Aspirin. However, a study found that taking a tablet that exerts the same effect as Aspirin reduced hangover symptoms, apart from tiredness, by on average a whopping 86%! Reduction was most effective when two tablets were taken before drinking and a further two before going to bed. However, there were concerns that Aspirin use with drinking may come with a risk of gastrointestinal bleeding(1). So, be careful. 2. Hangover pills: A brand of hangover pills sold in France, named Aftereffect, decreased hangover symptoms when taken before drinking on average by 50%, without any reported negative side-effects (2). Sadly, I can’t find anywhere to buy them. 3. Red Ginseng: Consuming a red ginseng drink before commencing drinking decreased overall hangover severity by 38% (1). Not bad, not bad. 4. 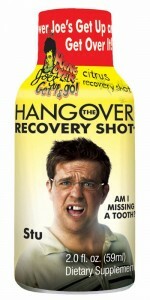 KSS Formula: Decreased hangover symptoms by one third. Was found to be more effective when taken before drinking (3). 5. Korean Pear Juice: Consuming a Korean Pear juice drink 30 minutes before commencing drinking decreased hangover symptoms on average by 16-21% (1). Good, but certainly not great. There is no treatment to date, that appears to be effective when taken after the onset of hangover. But if you’re organised and take some of the effective treatments before you wet you whiskers, you could stop that hangover before it arrives (to a degree)! Very healthful: Aspirin and Aftereffect hangover tablets. As I said be careful with Aspirin and to be safe, first seek medical advice. By far the best hangover treatments. Moderately healthful: The natural remedies: korean pear juice, KSS formula and red ginseng will offer moderate relief. Healthless: IV drip services (also expensive), hair of the dog, artichoke extract and fructose and glucose supplements have no effect on hangover symptoms. Lots of water, an aspirin before bed, and a good starchy breakfast (like bagels) works for me! Good call. I would love to see a study comparing the various different hangover foods! I think you missed the most basic hangover cure: water. Alcohol takes water away from your body (hence the headaches). To fight this dehydration, just drink water. Ideally, you could have one glass between any two drinks. But I’ve found that this is not always feasible in reality. 🙂 But just drinking a couple of glasses of water before going to bed after a night of drinking seemed to help quite a bit as well. Of course, this is not scientific evidence (besides the fact that alcohol does lead to dehydration), but it works for me. Finally, eating well before drinking, not mixing different kinds of alcohol and drinking high quality booze also helps a great deal. I’ve been especially surprised how big of a difference the last one makes. But this is only anecdotal evidence of course. That’s absolutely true, heyoaff. I think water and eating certainly help with the dehydration caused by alcohol and are important in hangover prevention. But, I don’t think they target many of the symptoms. For example, water and food are unlikely to alter the direct effects of alcohol, which include: gastrointestinal disturbances, low blood sugar, disruption of sleep and biological rhythms and electrolyte imbalance (food might alter that to a degree) (see: http://pubs.niaaa.nih.gov/publications/arh22-1/54-60.pdf). Before you head out tonight, read this and prevent tomorrow’s hangover! – not to mention the long term effects- instead of moderating the amounts in the first place. Of course a healthy remedy of relief is nevertheless preferable to a potentially harmful one. Haha very true. Why thank you. There is one remedy that works extremely well but it can have a side effect. Let’s say you are going to a beer festival and plan on drinking a 6 pack [78 ounces of beer]. Prior to drinking consume 6 teaspoons of dry active yeast. The yeast will absorb the alcohol in your system and your lower intestinal tract does not effectively digest the yeast before it passes from your body. A person of average weight, let’s say 175 pounds, consuming 3 beers per hour for two hours will be well over the illegal alcohol limit for driving in the USA [most states it is .08 blood alcohol content] but with the yeast in your system it is not likely to exceed .03 or .04. Now for the down side; in many people the yeast will act as a diuretic and you may have a day of the scoots following your day at the beer festival. Pingback: The stone cold science on hangover cures: this will surprise you! | Is it healthful? I recommend placebo drinking. This form of fluid consumption substitutes any wet beverage for alcohol. The only possible downside is a possible placebo hangover! Nice to read a fun article. Feel better. Haha I’ll be sure to give this a try. Thanks, Jonathan! Very helpful, thank you. Especially right before 4th July! Thanks, Esther. Enjoy your hangover, or lack thereof. ← Should you be exercising your face?